No sign of rain but at least the smoke isn't as bad. 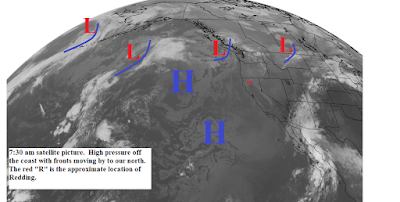 Today through the weekend we will continue to see frontal systems move by to our north across western Canada. Northern California will be mostly clear with a few clouds this weekend. Temperatures will be few degrees above normal. Gusty north winds will occur today and Thursday in some areas. Next week a large high pressure ridge will pump up just off the coast (see map below). The north state will continue dry with periods of north winds. Temperatures will be above normal.